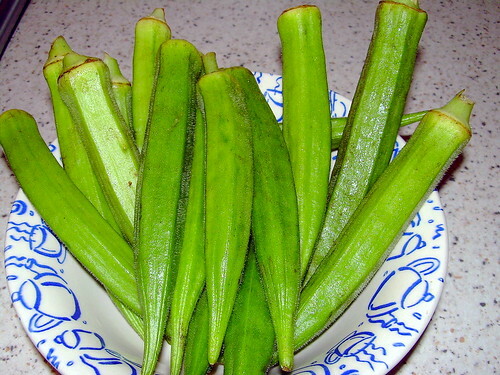 Ladies finger, also known as Okra, is a fibrous pod full of round white seeds. Packed with vitamins and minerals, it is often used in Asian cuisine especially in India. Back home in Malaysia, it is commonly added to Assam Fish or Curry Fish. 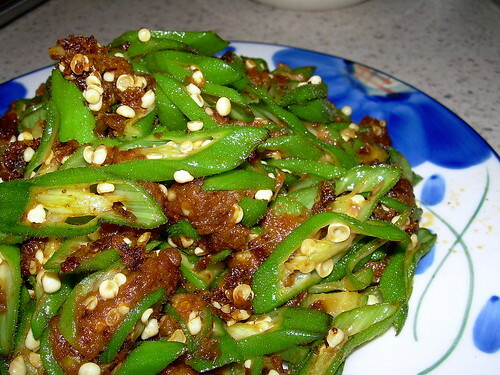 It is also cooked as a dish of its own and I usually stir-fry it with belacan sambal. When choosing ladies finger, choose the younger pods which are usually lighter green in colour and smaller in size. Usually, the younger pods will have softer fur-like skin. These younger pods are more tender in texture and less fibrous. And again, just like Kangkong Belacan, you should cook this dish using really high heat as you want to cook it in minimum time to preserve its juice. Heat oil on wok at medium heat. Stir-fry the sambal belacan mix for about 2 minutes. Increase heat to high and add ladies finger and sugar. Stir well for about 2 minutes or till the ladies finger is to your desired softness. Add a little water at a time if sambal belacan mix beginning to burn. As the sambal belacan mix contains dried prawns and belacan which are salty in itself, it may not be necessary to add salt. This is a great dish, but I don’t cook this much here in the States because the ladies fingers are super expensive here. rasa : Yes, i would imagine that. Bean sprouts was a luxury item for me when I was in England.